Talk to any parent with a child with autism spectrum disorder and they’ll tell you that small events, like haircuts and dentist visits, can cause untold amounts of stress. As described in For Children With Autism, Opening a Door to Dental Care, finding a dentist willing to work with the family is a key to success. But dental cleanings happen only twice a year. What counts as much, if not more, towards dental health is whether a parent can brush a child’s teeth twice a day. Children with moderate to severe autism may not be willing to cooperate with a parent wielding a toothbrush—and many parents would call that a spectacular understating of the challenges they face in establishing an every day routine of parent brushing, and eventually, where possible, teaching the child to take over that responsibility. Start early. Many dentists encourage parents of all children to accustom a child to the brushing sensation on gums even before the first teeth appear. Once a child is diagnosed with autism, getting him used to the idea of the toothbrush’s approach as young as possible becomes even more important. As with dental visits, don’t wait. Go electric. You may have a very small window of brushing opportunity. An electric toothbrush helps you make the most of that time. Reward. “Bribery, bribery, bribery,” said a parent on Facebook. Ms. Raposa put it a little more tactfully, suggesting a small reward every time a child allows the brush in his mouth, particularly in the beginning, or when introducing the electric toothbrush. But not with candy. In this context, skipping the candy reward is obvious. But many children who are on the spectrum get rewarded when they finish a task at school, and sometimes those rewards are candy. Check with your school or program, and if candy is a frequent prize, ask that it be limited or eliminated, and suggest (or provide) nonfood rewards that will work for your child. Offer choices. All children like to have some control. You can have a selection of toothpastes for a child to choose from, or a variety of heads for the electric toothbrush, or allow the child to choose where in the mouth the brushing begins. Set up the routine. Let your child know what will happen, and in what order, using pictures as well as words. Create a picture schedule of exactly what will happen, whether it’s a brush in the mouth, then a reward, or the eventual longer routine: Pick the toothpaste. Pick the toothbrush head. Turn the brush on. Open mouth. There are apps that make creating these schedule boards easier, says Ms. Raposa, like Custom Boards, which allows you to search for pictures or use your own. Watch the toothpaste. The ribbon of toothpaste portrayed in ads is way too much, says Ms. Raposa, “particularly for children who may not be able to spit it out.” A smear, she says, is enough. When children graduate to brushing on their own, one parent suggests a wall-mounted toothpaste dispenser for those who may not be dextrous enough to manage the tube. Make the ending clear. Brush for “a count of 10,” or sing a song — the same song — nightly, ending the brushing when the song is done, or use a toothbrush with a timer. 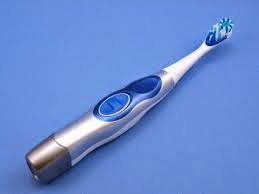 This lets a child anticipate when a parent will finish brushing, and later, know how long to brush himself.